We are SO EXCITED! 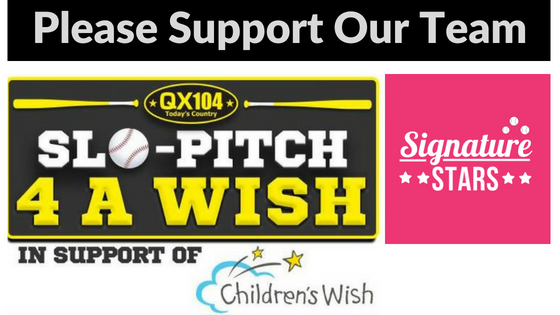 Signature Cleaning Services has registered a team for the Slo-Pitch 4 A Wish Tournament in support of the Children’s Wish Foundation! We’ve already started practicing. We can’t promise we’ll win, or that the ball won’t go right through Diane’s legs ( ha ha true story) but we will have the best time ever for a really good cause! By supporting our team: The Signature Stars – You will have the opportunity to create the magic of a wish for a local child, and make their most heartfelt wish come true. Please donate to sponsor our team for this great cause even if it’s only a dollar: we APPRECIATE your support!